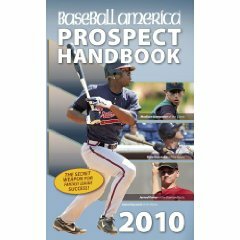 The Baseball America Prospect Handbook is simply a must-have for any minor-league baseball fan. My handbook, in which Baseball America ranks the top 30 prospects in each organization, came in today, and since I ordered it straight from BA they included a 31st prospect supplement for each team. I’m listing where Kentucy players rank in their organizations below, but I’ll leave all BA’s analysis out as incentive for you to go buy their great product. Former Bat Matt Maloney picked up his first major league win and Darnell McDonald hit his second home run for the Reds. EKU alum and former Lexington Legend Josh Anderson hit his first home run of the season for Kansas City in a victory over his former club, Detroit. Louisville Slugger has created its own “wii-mote” attachment for popular baseball games on the Wii. MLB.com profiles former Legends Tommy Manzella and Chris Johnson as they await their shot with the Astros. Tuesday marked the official expansion of MLB rosters from 25 to 40. While no team actually carries 40 players during the “September Callup” period, many teams bring some young players up from the minor leagues to either reinforce their team for a playoff run or have and extended audition for next season. We’ll use this post to keep track of any players with Kentucky ties that are called up to the big leagues as minor league seasons end. Major-league players who were activated from the disabled list because of the expanded rosters are also noted. New additions are bolded.